Planning a corporate event involves a lot of work, but if you choose the right corporate event facility in Orange County, much of the work will be done for you. Orange County Mining Company has long been a favorite of those planning such events. You want to know that you can count on the staff at the venue you choose. When phone calls are not returned promptly, it can make your planning more stressful. An extensive menu makes planning, especially for larger groups, a lot easier. You want a corporate event facility in Orange County that will have something for everyone. For example, some venues will not have basic audio visual equipment, which means that you will have to bring your own. Find a venue that offers such amenities on site and you’ll cut down on your work load. Too large of a room can be just as uncomfortable as too small a room. The best corporate event facilities will have several rooms to suit groups of all sizes. A lovely atmosphere can be the difference between an acceptable corporate event and an unforgettable one. Nicely appointed rooms and rooms with a view can make any event extra special. Cost is an issue for businesses of all sizes. You do not necessarily want to find the lowest bidder, but you should make sure that you will be getting the best value for your money. There are many reasons why companies of all sizes turn to Orange County Mining Company when they need to hold a corporate event or meeting. We have a variety of packages to suit every budget. Our packages, such as the Meeting Planner’s Package, includes everything you need for just one price. Simply select your package and we’ll take care of the rest. Our friendly staff works hard to make sure that every event held at Orange County Mining Company exceeds the expectations of our guests. Our menu is extensive and we can even custom tailor a menu to fit the needs and preferences of your group. The banquet and meeting rooms are well-appointed, beautifully decorated and many feature absolutely unforgettable, sweeping views. We have rooms to accommodate parties of all sizes from 30 on up. While choosing to hold your meeting at a hotel is an option, you will likely get a cookie cutter experience rather than one that has been tailored to meet your needs. Also, you may end up paying more for the same service and amenities that you would get at Orange County Mining Company. Every year we host Christmas parties, retirement parties and meetings. Many of our corporate guests come back again and again because we work so hard to make the planning process easy on them. Why worry about every little detail when we can handle much of the work for you? Use us once, and you will see why we are one of the most popular corporate event facilities in Orange County. We aren’t the only corporate event facility in Orange County, but we strive to be the best. 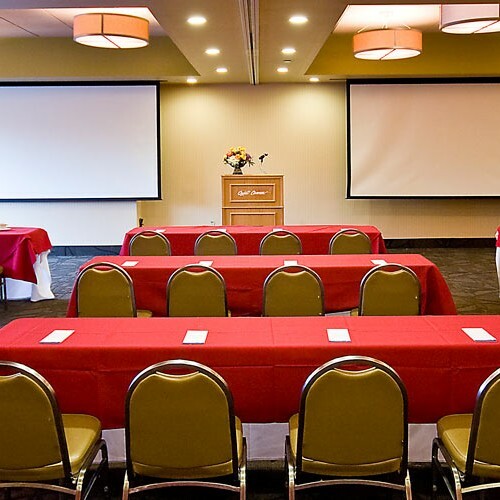 Contact our friendly staff today to learn how easy we can make planning your next event or meeting.